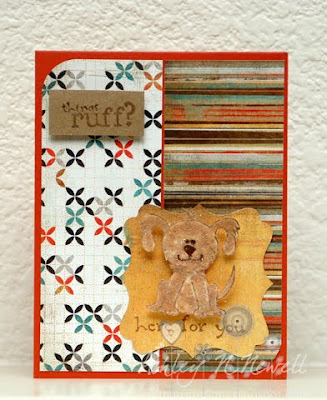 Here's the card I posted for yesterday post over at the Paper Maniac blog. Did you see the new March special?!? 35% off on ALL ribbon! Plus there's new CHA stuff coming in every couple days. Swoon! Here's a card I made for you all this week because I know that sometimes we all get a case of the Mondays. ;) I made this card using Unity I Ruff You. And the paper is the adorable Basic Grey Max and Whiskers. I covered the cute little pup in Sparkly Fluff.